Our seasoned wood is ready to burn immediately. Most of our customers choose this option. Our wood selection is typically a mixture of hardwoods including oak, cherry, maple, beech, ash and birch. 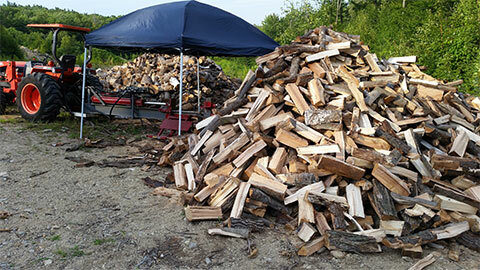 The wood is cut and split at 16” length so that you may stack 3 rows tightly into 4 feet. This size accommodates most homeowners. If you have a very small or very large stove and require different lengths please see that section on custom firewood lengths. Semi-Seasoned wood is freshly split from logs that have been down for a year or less. There will still be a lower moisture content than green wood, but may require a few months to dry to the state that seasoned wood will be. As a result it can save you a few dollars. Cut length is 16” unless custom ordered at a different length. Green wood is cut and split from trees that were standing live very recently. The moisture content in green wood makes it unsuitable for burning as heating fuel. Much of the energy you hope to heat your home with will be wasted boiling the water out of the wood as it burns. Green wood can also contribute to excessive amounts of creosote in your chimney or stove pipes. Green wood is less expensive than seasoned or semi-seasoned, but you need to buy it and stack it a year ahead. 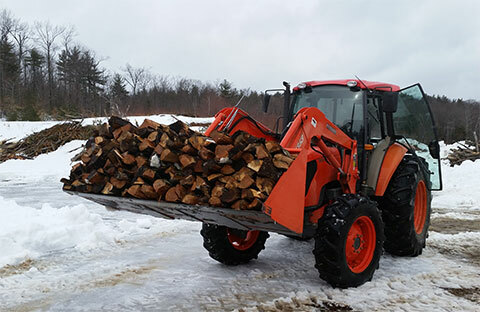 For the adventurous homeowners who wish to take on the arduous task of cutting and splitting their own firewood we can sometimes offer a full log truck of 20’ long mixed hardwoods. These logs are the same type we purchase and use to produce the firewood we sell. Grapple loads are always fresh from the woods on land clearing projects so they are very green. 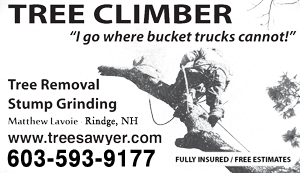 Operating a log truck over the road is very expensive so these sales depend upon your location and the location of the land clearing project. We cannot deliver grapple loads during the months that roads are posted with small weight limits. Pricing is subject to distance and availability. Please email or call to discuss further. Our standard size for firewood is 16”. We can adjust the processor to cut shorter or longer for you when you have a very small or very large stove. Custom sizes do incur and upcharge for the set-up change time, and in the case of smaller pieces more cutting and splitting cycles.